Imagine, for a moment, that you are strolling through a forest on a warm spring day. 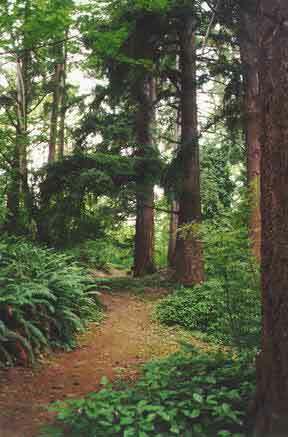 As you gaze about, you notice that in the deep shade, ferns flourish as mushrooms push up through the moist soil. Water lilies float upon the surface of a nearby pond. In the distance, wildflowers dance in the breeze of a sunny meadow. Each of these plants requires certain conditions in order to flourish. The ferns would wilt in the sunny meadow; the wildflowers would fail to bloom in the shade. Without ample water, the water lilies could not survive. In simplest terms, Ayurveda is the wisdom that explains what conditions are necessary for each of us to thrive. It provides the knowledge to understand what is required, and the tools to make it so. Each of us is unique and has unique requirements, and Ayurveda provides answers for this as well. When we align our selves with the natural balancing forces of the universe, profound changes can occur in body, mind and soul. The timeless, eternal wisdom of Ayurveda helps us to understand the way. Ayurveda, which literally means “the knowledge and wisdom of life”, originated in India over 5,000 years ago and has been continuously practiced ever since. It is considered by many scholars to be the oldest healing science in the world, often called “the mother of all healing”, and is the healing side of yoga. The wisdom that Ayurveda imparts forms the basis for an understanding of the workings of nature and our interrelationship with it. According to Ayurveda, all of nature, including our own selves, is created of the same basic materials and is affected by the same cycles, laws and rhythms. Gaining an understanding of these forces empowers us to take charge of our health and well-being. Ayurveda provides the foundational knowledge and the tools necessary to apply these basic laws of nature to our daily lives. As we do so, our bodies, minds and souls respond quite naturally with a return to our intrinsic nature: a healthful state of balance. According to Ayurveda, health is achieved by restoring our natural state of balance. At the time of conception, our unique individual constitution is determined. Ayurveda understands our constitution on a cellular or energetic level, and when we live our lives in a balanced, wholesome manner, the energetic balance is maintained and illness can find no foothold within our being. However, we live in a world fraught with stresses and unbalancing influences that undermine our natural state of balance, opening the door for disease and disharmony. Ayurveda provides the framework for an understanding of our natural state of balance as well as our imbalanced states. When the body is out of balance or harmony, it communicates this imbalance by creating symptoms. Symptoms can be thought of as our body’s cries for attention. When we listen to our bodies and make the necessary changes, balance and harmony are restored and symptoms disappear. This is how the body heals itself.